Bukhara is quite simply outstanding. It is one of Uzbekistan’s oldest cities that stands on a sacred hill. Like Khiva, UNESCO backed the renovation of much of the city for its 2,500th anniversary in 1999. The city was once an important hub on the Silk Road and a key learning center of Islamic Central Asia. 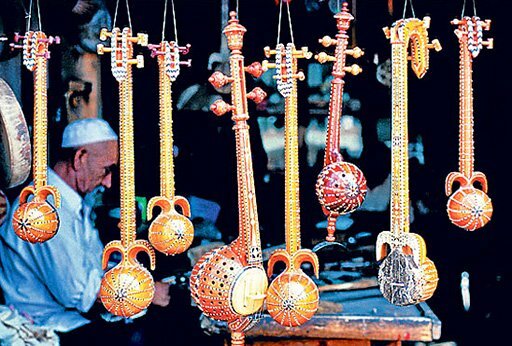 The city has more than 100 religious colleges and about 350 mosques. Bukhara has also preserved about 150 ancient monuments of architecture some which were built in the Middle Ages. The highlight of this wonderful city is the Poi Kalon complex. The architectural ensemble encompasses such gems as the famous lighthouse called Kalon Minaret which is about 150 feet high. It is the only original building in the Poi Kalon that dates back to 1127, it is also considered the tallest building of its time. Right by its side is the Kalon Mosque built in the 16th century. The Ark standing on a hill is also worth a visit. 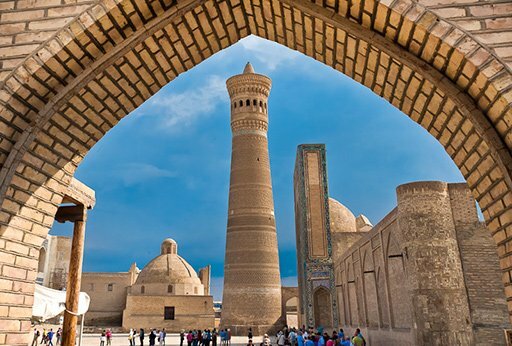 The fortified residence of the Emirs of Bukhara who were the despotic and ruthless leaders, was their royal home from the 5th century until Soviet times. The pillars at the base of the building are believed to have been set up in accordance with the location of the brightest stars of the Great Bear. Another must-see in Bukhara is the Job’s well which is also called the Chashma Ayub. It is believed that the prophet Job created a source of fresh water for the local people suffering from water shortage. The water was considered to have healing power, and for that reason a mausoleum was built over the source.